The rim depth of our CROSSWIND (29mm) and FLY (28mm) requires an extension to standard length presta tubular tire valves. This valve extender is 1.10 inches (27mm) long and 1/4 inches in diameter (6.1mm) . It is turned from one piece from aircraft aluminum alloy. Black. We recommend a three step process to prep your tubular tires when installing. See Tubular tire advice. Most riders leave extenders in place while training and racing to facilitate quick tire inflating. The aero advantages of removing extenders are minimal (varying by wheel configuration, 0.4 to 1.2 grams drag). The Tufo 20mm extender offers a slightly higher cost, but sometimes more functional extension of the length of the tire stem. 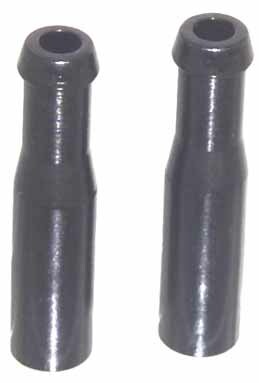 This extender threads into the tire stem at the bottom (male thread) and moves the valve core from the stem to the top (female thread) where it threads into the extender. This leaves the tire valve available for the tire pump. The extender is machined from aircraft aluminum. There is also a small plastic tool available to install the extender and work with the valve core. This work can also be done (carefully!) with a pair of needle nose pliers. Note the two small mid section wrench flats for tightening the extender into the tire stem. Also see our three step tire set up process Tubular tire advice. Again, most riders leave extenders in place exchanging the minimal aero advantages of removing extenders for the greater control and ease of quick tire inflation. Removing this style extender removes the tire valve core and deflates the tire.